Measured Group is a multi-disciplinary exploration and mining consultancy with over 100 years of combined experience in coal and minerals across the world. Based in Brisbane Australia, the group provides services from greenfield exploration right through to mining studies, including Due Diligence and Technical Expert Reports for the investment sector. We have supported and continue to support mines and projects in QLD, NSW, SE Asia, Africa, North and South America, Russia and Iran. Chris has over 18 years professional experience working as a geologist in underground and open pit mine operations, near mine exploration, consulting and software training. Chris gained technical and operational experience at Pasminco’s Elura operation in Cobar NSW and Dominion Mining’s Cosmo Howley Operation in NT. He worked for Maptek in their Vulcan software division conducting training and consulting for numerous companies and operations throughout Queensland, NSW, SE Asia, Northern Asia, South Pacific Islands, North America and Africa. He has experience in resource modelling for open pit and underground deposits in gold, copper, nickel, lead/zinc, iron ore and coal. Chris has been involved with iron ore deposits, copper/lead/zinc deposits, nickel deposits, gold deposits and coal deposits. He has expertise in mine planning software Vulcan, Surpac, Datamine, Mapinfo and Whittle. Chris is a Competent Person in various commodities. Gary is an open cut mining engineer with over 35 years mining and civil engineering experience who specialises in mine planning, mine operations support, optimisation and strategic advice. Gary has held senior operational and technical roles in open cut mines as well as large civil construction projects. He has been involved in a diverse range of consulting activities, including strategic studies, expert advice, litigation support, technical audits and due diligence and leading numerous major feasibility studies. Gary provides support for operational planning, plant maintenance studies, equipment and mining method analysis, contract preparation and tender assessment. Gary’s technical experience covers a broad range of projects, geological settings and commodities, including coal, gold and base metals in mining operations and projects in Australia, Africa and South-East Asia. Gary is a proficient user of a range of mine planning software packages, financial modelling solutions and is a Competent Person for the purposes of JORC reserve and estimation and reporting. Peter is an underground mining engineer with over 30 years mining industry experience who has worked in senior corporate and site based roles providing operational management and support, project development and technical services. Peter specialises in project evaluation and development, due diligence, mine planning, operational support, optimisation and strategic advice. His technical expertise includes underground mine planning, optimisation, risk management, feasibility studies and operational planning (including equipment selection, contract preparation and tender assessment). Peter has also undertaken a number of major feasibility studies (from concept through to full operations) and has been involved in numerous operational support activities covering mine and operations optimisation and the implementation of new mining technology. Peter is proficient in the use of various mine planning, optimisation and financial modelling software and is a Competent Person for the purposes of JORC reserve estimation and reporting. David has over 20 years working as a geologist and geotechnical engineer in Australia with experience in site based operational support and project evaluation within underground and open cut mining environments. He specialises in geotechnical mine planning, regulatory requirements, specific systems and processes, data collection and analysis. David is also experienced in personnel training for difficult work environments, auditing and reporting. He is proficient in Vulcan and Surpac mine planning software and is a user of geotechnical specific software Rocscience suite (Rocfall, Slide, Swedge, Unwedge, Dips, and Rocdata) and the slope stability tool Galena. David has worked on numerous coal deposits in Australia (Bowen Basin and Sydney Basin), is experienced in Western Australia and South Australia in hard rock open cut and underground operations, and has worked off shore for diamond recovery. A registered quarry manager with the WA mines department, he has also worked on numerous coal and base metals deposits in senior operations and technical roles, has undertaken a number of major feasibility studies and has been involved in a diverse range of geotechnical functions. 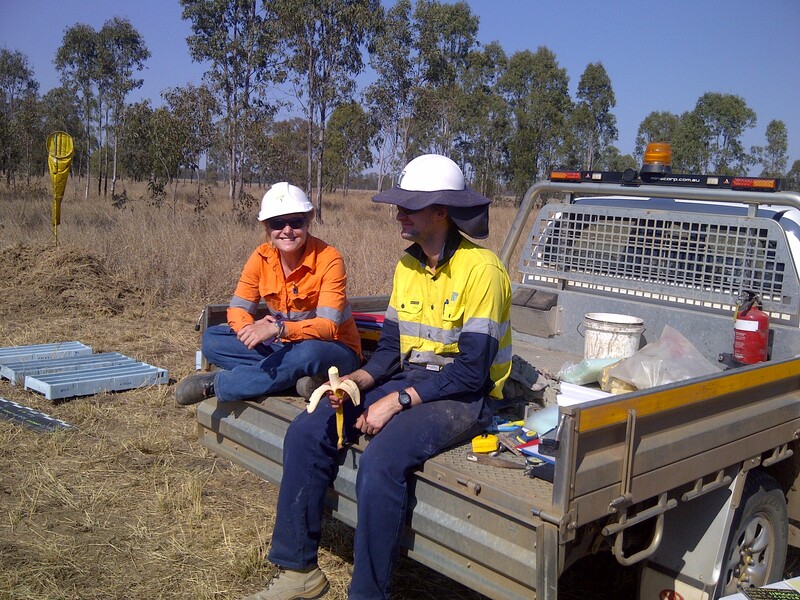 David is a member of the community of geotechnical practitioners for open cut coal (BOHOG) and AusIMM. Peter has 15 years experience working as a coal geologist in Australia, with operational and technical experience in both open cut and underground mining operations.. He is an advanced user of Vulcan, Minescape, Micromine, GoCAD, I-site and ArcGIS and is recognised as a Competent Person for resources and mineral inventory. Peter has been involved in the development of multiple structural and resource models as well as management, validation and reconciliation of various databases/systems. With his extensive knowledge of mining processes he has managed and developed geological exploration teams and mentored peers in geological modelling, data manipulation and interpretation methodologies. Mariya is a resource geologist with extensive experience in exploration, mines, and consulting positions in Australia, Kazakhstan and Russia in various metals and coal projects. Her specialisations include resource modelling and estimation, JORC Reserve estimation, database design and management, business development and project management. Mariya has bachelor degrees both Geology and Finance. She is proficient at using a range of software packages including Task Manager, Datamine and Leapfrog. Louise has extensive experience as both a geologist and tenement manager having worked as a Project Geologist for many years before branching into land and tenure management. Her years as a geologist mean she is highly proficient at writing annual reports, relinquishment reports, applications and project approvals for both minerals and coal. She has a clear understanding of the relationships between tenement management and operational activities. Louise is also experienced in coal exploration drill hole planning and execution of drilling programs, and is highly proficient in coal seam correlations having correlated the Surat and Bowen Basin coals seams and regions of the Hunter Valley. She is proficient at using a range of software packages including Minescape, Task Manager, acQuire, Strat3D and Mten. Since beginning her career with Measured Group, Britta has proven herself adaptable and quick to learn. She is a competent and diligent field geologist who excels at database management and data interpretation. Britta’s experience includes Hazard Plan reporting, database compilation for mine management, and mine model interrogation using various software packages. Measured Group’s team of experienced Field Geologists are hard working, team players, who will deliver reliable and accurate geological data at all times. Their years of experience, gained working in Australia and overseas, allows them to be able to work anywhere, with or without supervision and in any commodity.